Our facility is heated and air conditioned for your pet's comfort. There are 31 indoor/outdoor runs, 2 Large runs and 3 Extra Large runs. There is a laundry room where pet bedding is washed on a regular basis, a feed room equipped with a refrigerator/freezer to accommodate our pet clients that are raw fed and we have a fully equipped grooming room so that your pet can enjoy a spa treatment before going home if you choose (please see grooming page to set up an appointment in advance). 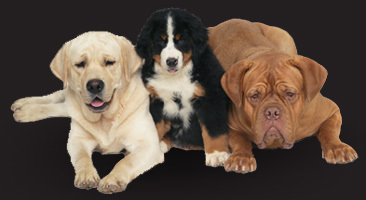 Boarding dogs can have an optional 1/2 day of daycare. Rates are subject to all applicable taxes. Call us for details on how these 2 great programs differ. We are pleased to offer discounts on reservations that are for 10 nights or more (please call for more information). Each dog boarded at Kalmegess must be up to date with all vaccines, based on the individual vaccine protocol of the pet.